DxO Optics Pro improves your photos. But we improve them more, and better, than any other program. And we improve them automatically. We’ll explain why. 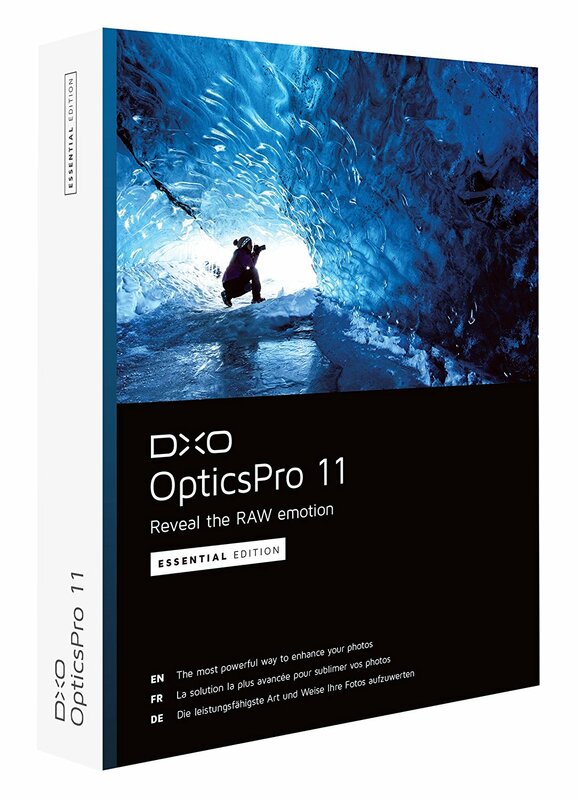 DxO OpticsPro ESSENTIAL EDITION includes powerful and automatic RAW and JPEG image-processing tools. Its numerous presets allow you to adapt the processing to suit your own tastes, and to bring out the best in your photos in just a few clicks. DxO is known for their work evaluating lenses, expanding into corrections for individual lens characteristics, branching into software, and now making their own camera. Their Optics Pro is basically an alternative to Adobe’s Lightroom. Like Lightroon, & Corel’s Aftershot, it will help organize & process regular jpeg images, but it’s really intended for RAW photos. Think of a RAW image or photo as all the data the camera’s sensor captured — a jpg image is that data transformed into a picture you can view etc. So, you import a collection of [or just one] RAW photos into Optics Pro, mostly perform adjustments, apply some or all of those adjustments to all or part of the batch, and output jpg images you can edit further in your choice of image editing app. Your original RAW image files are unaltered. Optics Pro also lets you save your images in the DNG format, which is an open, RAW format from Adobe, rather than the RAW file format you get from your camera. That won’t matter to everyone — I like it to turn photos of film negatives into positive RAW images I can work with in Lightroom, but I’m sure there are other uses. DxO used to give away older versions of their Optics Pro software — this is the same, 64 bit only .NET app they’re currently selling with some features turned off. It’s a larger app, but most of that space is taken up by images rather than code, so you might be able to pare it down a bit from its installed 560 MB if necessary. Older versions of Optics Pro stored their presets in the ProgramData folder, with copies in the User’s AppData\ Local folder — now they’re just stored in that AppData location, which could effect those with more than one Windows user account. Older presets, e.g. the Negative preset I use from v.7, can be copied into the appropriate v.11 folder & used. That all said, DxO Optics Pro is no Lightroom, but you don’t have to pay $10/month for a P/Shop CC subscription to get it [like you do with the latest version of Lightroom]. I don’t have the pro version of Corel’s latest Aftershot software, but Optics Pro IMHO is more capable that their earlier pro version, as well as the latest non-pro version that Corel gives away. And the automated features in Optics Pro could come in handy for many — IMHO you Have to go through at least one or two short video classes on-line to just begin to approach Lightroom. There can be quite the learning curve if you’re new to RAW image processing. DxO OpticsPro 11 Essential is a powerful and reliable image processing software, designed to automatically correct your photos by taking the camera model and lens into account. It comes packed with a bunch of powerful tools for processing images, and has support for plugins. The RAW conversion and enhancement tools produce the best possible quality from camera RAW files. As expected from an image processing software, the installer has a large size of ~444MB, which might take some time to download on slower connections. The installation process is however pretty quick and simple, and takes a minute or two to finish. After launching, a screen pops up asking you to activate the program, which can be done by entering the license code you have. If not, you can use it for 31 days on trial, but it does require you to register with your email. After that is done, the main UI of the application loads, and you can start using it. The UI has a modern and clean look in a dark gray color. It is divided into two main parts, namely ‘Organize’ and ‘Customize’. To the left, there is an file/folder browser that looks like the one we see in Windows Explorer. This let’s you quickly and seamlessly navigate through directories and locate images you want to. On the top, a menu bar is present with drop-down menus that let you access different tools and options. Under it are buttons to toggle between the two interface modes, side by side comparison, zoom, image view changer, a reset, and apply presets button. The ‘Customize’ mode contains the same buttons on top with addition of crop, color picker, rd eye, and more. On the right side it shows the EXIF information with details about lens and camera used, where as on the left, it contains color histogram, and tools arranged under different tabs for easy access. At the bottom, it shows all the images from the folder or directory currently open, and with icons it highlights whether the photo has been edited, or if a module to apply is available for download or not. As soon as you open an image, this application automatically generates an image that’s auto-corrected by its algorithm. It identifies the information from the EXIF data embedded in the image, and applies a set of lens corrections developed by DxO’s own optical testing laboratories. According to the developers, the application has correction algorithms for a total of 30,000 camera/lens combinations. The camera/lens profiles that power these corrections aren’t included with the installation of the application, so as soon as the application detects a new combination, it asks the users to download the module. The process is very easy, all you need to do is hit the ‘Yes’ button, and the application downloads and adds the module to itself. The auto correction produces great results by which most of the users should be satisfied. However, if you want to dive deep into editing, the application has RAW conversion and optimization tools for that. Moving on to manual editing and corrections, thing do tend to become a little complicated. There are six panels: Histogram, Essential Tools, Light, Color, Detail and Geometry. The histogram is a graphical display showing information about colors. Other panels contain sub-panels like White Balance, Exposure Compensation, DxO Smart Lighting, Selective Tone, DxO ClearView, Contrast, Colour Accentuation, Noise Reduction, Horizon, Crop, and many more. Most of these sub-panels come with sliders to adjust them according to your needs. Many of these features are complex and it might take some effort to achieve desired results. Great auto-correction based on camera and lens characteristics. Correction algorithms for a total of 30,000 camera/lens combinations. Direct export to Flickr, Facebook, or other photo app. Limited tools and possibilities compared to the other tools. It does take a lot of time to process some large RAW image files. DxO OpticsPro 11 Essential is a great tool for RAW image processing. It’s auto-correction capabilities are brilliant, producing great results for most of the images. The presets included are great, and can be used right away to give your photos a great look. The manual adjustments and optimizations, might take some time for a regular user to figure out. The application does not use a lot of system resources, and runs smoothly without running into any crashes or errors. DxO Optics Pro 9 Elite Edition is quite easy to use program, in my opinion. Absolutely professional. It does not support my D7200 which was released in April of 2015. From a professional point of view, DxO Optics Pro 9 Elite Edition is a handy program especially if you want to take advantage of automatic photo processing for better results. Some background knowledge in photo adjustment processes will be helpful in using this program’s features to the fullest. Otherwise, this program does a good job in manipulating your raw photos. Photography is one craft that heavily hinges on practice and experience. In addition to taking great photos, the next major part is editing or processing them. It is at this stage that you would have to turn to photo editing programs. Using such applications more often than not demand focus and time in adjusting the different aspects of pictures to finally get great results. DxO Optics Pro 9 Elite Edition throws in a twist to that process. It can process and improve your pictures automatically! Right away, that feature seems exciting and here is what I found out. Right off the bat, DxO Optics Pro 9 Elite Edition seems like a solid package that you would need especially if you are professional photographer or just like taking photos. If you have fast internet connectivity, you should be done downloading the installation file. Not only will it possible to install it on Windows Vista through Windows 8.1, as well as on Mac OS. As you explore this program, you will note that the features are somewhat complex. Before you even get into the details of how DxO Optics Pro 9 Elite Edition and its features work, it would be comforting to know that DxO are actively creating and releasing profiles for new cameras and lenses. This approach is particularly helpful given the fact that the program can adjust the noise and lighting of your pictures automatically. It will do so based on the specific lenses that were used to take individual photos for the best results. With this feature, I was able to end up with smoother pictures. You would want to note that this feature runs a process that takes few minutes to complete. At the same time, this feature is helpful especially if you are after crisper photos. To get even better results, you can opt to use the High mode noise reduction process. I couldn’t help but notice DxO’s Smart Lighting feature. That is the case because it came in handy in photos I had taken in shadow areas. The feature was effective in ensuring I recover the photos in a nice way with high level of shadow detail. In most cases the results were impressive since the highlights were not much affected. As noted above, DxO Optics Pro 9 Elite Edition packs a considerable number of features that can be intimidating to beginners. This means that experts would get the most out of this program as others will have to put up many hours of familiarizing themselves with the features. It is worth noting that the automatic processing of images is great. However, in delivering such results, DxO Optics Pro 9 Elite Edition misses out on giving users the ability to apply further adjustments. As a result, I had to switch back and forth to Photoshop while I was using this application. “Not only will it possible to install it on Windows Vista through Windows 8.1, as well as on Mac OS.” Does it not work with Win10? Since you have already tried this I do have a question. Is your RAW copy still intact in case you do not agree with the corrections this makes? Perhaps someone intentionally shot an image and this program does not agree with the way it was taken can you override this correction that it made? Why keep the review of the PRO version 9 here with the offer for the ESSENTIAL (much limited) version 11? Quite a difference! Many of us rely on the reviews and user comments to decide when/if to take advantage of an offer, so posting a review for a different program might be a tad misleading. My previous reply didn’t post, so forgive me if this is a duplicate. The above review is for the PRO (full-featured) version 9, while today’s giveaways if for the ESSENTIAL (limited) version 11; some significant differences. Many of us rely on these helpful reviews and user comments to decide when a download is worth it for us, so highlighting a review for a different program may be a tad misleading sometimes.